Pepsi's brand-new chief (as of Oct. 1) is a powerful force behind the consumer giant's strong profit pipeline and $108 billion stock market valuation. 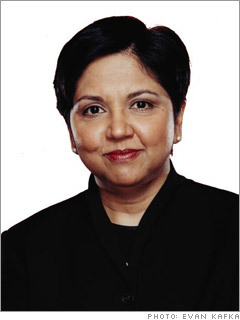 Formerly CFO and president, the Indian-born strategist reached the top even though she never ran a line operation at Pepsi. Nooyi believes in constant reinvention: "The minute you've developed a new business model, it's extinct, because somebody is going to copy it."